The Denver Nuggets went into Friday’s contest fresh off of a game in which they were completely dominated by the Houston Rockets. Denver only finished with 85 points on the night as they were demolished by the Rockets in Houston. 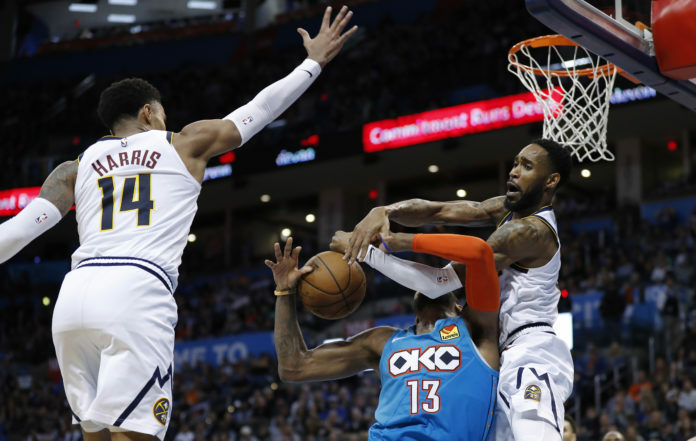 Denver’s offense has failed to get going in their last few games so, as the Nuggets headed into Oklahoma City, they were looking for answers on that end of the court. 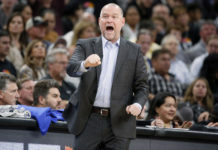 The Nuggets also went into Friday’s game on the second night of a back to back, but still pulled off a 115-105 victory over Oklahoma while also putting together one of their most complete games of the season. It is difficult to go with any negatives from Denver’s win over the Thunder, so here is my first good, great and awesome piece this season. The Nuggets put together a complete game as they received positive performances from multiple guys on both ends of the floor. That is exactly why the Nuggets ended up winning the game. There were zero players with a negative plus-minus for Denver in the game. Jamal Murray led the Nuggets with 27 points and also recorded five rebounds and nine assists while also locking in on the defensive end of the floor. 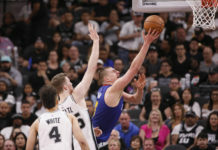 Nikola Jokic had 23 points, three assists and 16 rebounds to set the tone down low and that led to other players getting involved. Paul Millsap had 14 points and Will Barton had 12 points to provide balance, but both played phenomenal defense which really helped the Nuggets. Off of the bench, Denver got solid production from Mason Plumlee who finished with 11 points and five rebounds. Malik Beasley scored seven points and grabbed three rebounds while Monte Morris had four points and seven assists. Denver showed how deep they are for the entire game. Getting that level of consistency from multiple players made it that much easier for Denver to grab a big-time road win. That is exactly why they find themselves tied for first place in the Western Conference standings. 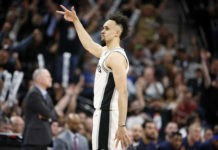 One of the biggest bright spots in the entire game was Murray who had his most complete game of the year according to Nuggets’ head coach Michael Malone. Murray finished with 27 points, five rebounds and nine assists and did not have a single turnover in the game to help secure the victory. Murray has been a player to watch these last few games as he has been having on and off games. He has been attempting to find consistency and this was a big game in which he showed up in against one of the best guards in the entire league. “He never got sped up, he was always under control running his team and being vocal,” Malone said postgame when asked about Murray. “I was excited watching him play not because he has 27 points, had nine assists and five rebounds but because of the leadership. This is what we need. Murray is having an up-and-down year, but when he shows up, Denver has been winning. He ran the offense well, hits big shots, took care of the basketball and has stepped it up defensively. That is exactly why Denver has been one of the best teams in the league. In Friday’s game he stepped up in a major way and the Nuggets would not have won without his contributions. I am not saying that the Nuggets have the blueprint to beat Oklahoma City, but it sure does seem as if the Nuggets have the Thunders number. Denver swept the Thunder this season as they won all four games and also are on a six-game winning streak against Oklahoma City going back to last season. The most impressive thing about this win was the Nuggets won it with tired legs. All year they have seemed to play their best without any rest. Denver is now 10-1 on the second night of a back to back which is the best record in the entire NBA. Denver is 8-2 in their last 10 games and, while they have not played their best, they have found ways to win games regardless. They are the only team in the Western conference that is now in the top-10 in both offensive and defensive rating. Denver has showed exactly why they are one of the best teams in the entire NBA as they are now tied with the Warriors for the first seed in the Western Conference. Golden State and Denver are deadlocked at 51-24 on the year, but the Warriors have the tiebreaker on Denver — for now. The good thing is the Nuggets have a chance to take back the tiebreaker when the two teams face off against each other in a few days. Not only would it be a great series if Denver faced off with the Thunder, but with the Nuggets recent success against Oklahoma City, Denver would have to feel pretty confident in the matchup.